Percentage of screen readers users in USA? "Percentage of screen readers users in USA" : Is there a place where I can find such statistics ? A more global statistic that would still be good too. Here I am not trying to discuss whether or not I should make my website screen reader friendly. Please stick to answering to the title of the question. If you want to answer whether people should do their website for screen readers or not then create a new question on this forum. When building a website for a client, I'd like to be able to sell the extra cost of making the website screen reader friendly. The problem is trying to sell it as an extra cost. A properly built web site is, by default, screen reader (and, as such, also search engine) friendly. (These estimates are for the number of blind people in general, but I think it's safe to assume that, in general, in the US most everyone uses the internet). Note that it's hard to define 'blindness' in a specific sense, so these numbers will always be a little fuzzy (no pun intended). But, again, note that focusing purely on screen readers is kind of missing the point of accessibility and machine-readability in general. To answer the askers question, it looks like we have to use a little deduction. Nobody seems to collect these statistics outright. Someone wrote a very detailed article as to why. So 88.5% of 326 million people = 288.5 million Internet users. 4.4 million users using screen readers in the USA. Screen readers are important. The most used is JAWS and you can download a copy here: JAWS Download. Thinking only about screen readers when developing is like thinking only about forks for a restaurant; sure, it's better than nothing, but patrons will think you're incompetent if you serve them a steak or soup. You can easily do better. Screen readers just scratch the surface of what is happening out there in the real world as far as user experience for the disabled goes. As far as selling the extra costs of accessibility; there isn't really a lot of extra costs. The barrier is just being familiar as a developer with two things: 1) How do you do it, and 2) What goes on with human experience when you're not looking. Almost no effort is required to maintain accessibility once you understand it. In fact, once you get a taste of the benefits that come with making a site accessible, you may do it for free. I'll attempt to solve both barriers for developers in this post. 2.3% of Americans are visually impaired and do/would benefit from a screen reader (source). I have 20/15 vision (Snellen chart details) and even I adjust my font size up and down many times a year. Judges are ruling that even the stance of "We're working on it now" does not protect you from a lawsuit, for example with Five Guys in New York (Source). 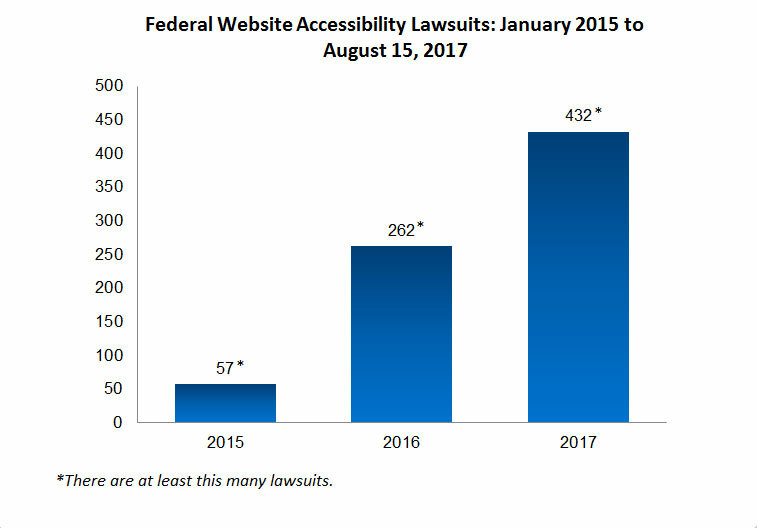 Basically, if your site isn't accessible, all it takes to get sued for more than the cost of the entire development process is a single upset disabled person, and the chances of a disabled person suing is more than doubling every year. The courts are overwhelmingly siding that the Internet is a public place and is therefore covered by the Americans with Disabilities Act. It's actually easy. You read one article, stay up to date on one website, and use one tool. The ARIA labels and relationships article by Google's website fundamentals team is all you need to understand how to talk to screen readers. The entire accessibility guide (that this article is a part of) will make you an expert, but the ARIA labels is all you really need to know. The Tota11y tool by Khan Academy is all you need to not only see how your site looks to screen readers, it shows you contrast and other A11Y compliance issues that will make absolutely everyone happy. You can add it to your website with a single line of code for testing. The A11Y project website. Keeps you up to date on absolutely everything related to happy disabled users. You could do the above 3 items in a single afternoon, you could also get a raise because you did it. We are judged in our humanity by how well we take care of our most vulnerable. I would say another way to word your request is potentially "Number of active (legally) blind computer users globally" Or maybe you can combine stats yourself, global computer users + global counts of the visually impaired. That being said, you should always code to make your site accessible by the greatest number of users, unless you can somehow guarantee your site will never be viewed by the visually impaired? It's a best practice. In my personal experience, I've found more revenue is earned the more you meet the needs of the client. Consider replacing "I'd like to be able to sell the extra cost of..." with "How can I better meet the needs of the client?" For example, say a client wants you to rewrite and reskin a website because it doesn't drive revenue for their business. You could do just what they ask, and in another year they could find someone else to rewrite the same website again for the same reason. Or, you could help them get to the root of the issue. Maybe many users come from mobile devices and the website looks bad for them. If you rewrote the site without using response design you may have not fixed their issue. Maybe their host is extraordinarily slow for the location of their users. If you used the same host it would again be the same issue. If you can help the client be successful the revenue will follow. They'll remember you were the one that helped fix the issue, you were the one that helped drive revenue, and you'll be the one they want to use again in the future. The National Federation of the Blind can help answer questions about statistics and need, and provide you with links to resources, including standards. However, the Americans with Disabilities Act (ADA) makes screen reader compliance pretty much compulsory. It should not be seen as an "if we can afford it" option. Not the answer you're looking for? Browse other questions tagged accessibility statistics screen-reader or ask your own question. Can/Should I Label an informational span for screen readers? Do screen readers have built in “back to top” functionality? Can screen readers interpret Unicode styles fonts such as bold and italics?